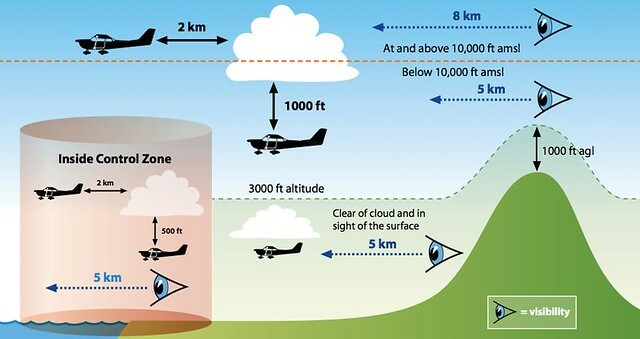 Visual flight rules (VFR) are the regulations that specify the cloud and visibility limitations for aircraft operating with visual reference to terrain. For a pilot to continue flight under VFR, the conditions must be equal to or greater than those specified by the governing body. In New Zealand, this minima is contained in Civil Aviation Rules Part 91 - Subpart D (Visual Flight Rules). Should these requirements not be met, aircraft may operate under instrument flight rules (IFR) and in certain cirucmstances, a special VFR clearance may be issued by air traffic control. For more on airspace classification, see Airspace classification. Fixed wing aircraft are required to carry enough fuel to fly to the point of intended landing, in the forecast weather conditions plus an additional 30 minutes . At night, this requirement is increased to 45 minutes. Should a situation occur where the aircraft is unable to land at the intended airfield, this additional fuel can be used to hold or divert to a suitable landing place. Helicopters differ in that they must have fuel to fly for a further 20 minutes, or a time period equal to the intended flight time of the flight is less than 20 minutes long. Aircraft are required to fly at a minimum of 1000 feet when operating over a built up area (such as towns and cities). Away from built up areas, this is reduced to 500 feet. Obviously, such requirements do not apply to aircraft carrying out an approach to land, balked landing or taxiing. Additionally, Part 91 makes provision to fly below these heights if there if the pilot in command is an instructor and is carrying engine failure training or if the aircraft is operating in a low flying zone. When an aircraft is operating above 3000 feet AGL up to 13,000 feet, the pilot is required to conform to the cruising table altitudes for the direction of flight. For northerly flights (270 to 089 magnetic heading) fly at an odd altitude + 500 feet. In other parts of the world, these requirements may be based on Easterly and Westerly headings. Given the North/South layout of New Zealand, the above method was adopted. 1. Civil Aviation Authority (n.d.) VFR MET Minima. http://www.caa.govt.nz/Publications/Other/VFR_Met_Minima_card.pdf, n.d.